When it comes to betting on Horse Racing, it pays to be informed. This guide to betting on horse racing will give you a better understanding of the betting types and markets so that you’re able to make your way through the various races, form guides and special bets available. Horse racing is one of the most popular betting markets available. There are some horse racing events where everyone is tempted to have a flutter, be it the Grand National or the Derby, and in these events, it is often just a single or each-way bet that is placed. Maybe you’re interested in hearing more about the other types of bets on offer. This section of the guide will help you find out which particular bet is right for you. These are straight-forward, no frills bets and this is no bad thing. First of all, a “win” bet is just that – if you bet on a horse to win and it finishes the race victorious, then you win the bet. Many experienced punters believe that traditional win betting is the only way to make regular profits, but the “safety net” of an each-way bet should not be disregarded. Each-way bets are for situations where you expect the horse to do very well but perhaps not to pull off the win. An each-way bet gives punters a return even if the horse they have bet on finishes in second or third place in a race with eight runners or more. In handicap races of 16 or more racers, the race may pay out to fourth place. If it’s a special event, pay-outs may occur even as far as fifth place. The returns of an each-way bets are calculated at one fifth of the odds in non-handicaps and a quarter of the odds in handicap races. If you are confident of a number of results in the world of horse racing and want to make a lot if winnings, then multiple bets are the way to go. Multiple bets are difficult to win as a lot needs to go right, but if it does, then you stand to make a lot of profit, even from a small stake. The multiple bet or accumulator can be anything from a combination of two results to a seven-or-eight horse accumulator. If one result doesn’t go your way, then the bet has been lost, so while the reward is great, the risk is large. There are special types of multiple bets. For example, the Patent links three horses in three single bets, two doubles and a treble, totalling 7 bets. The Yankee combines four horses in doubles, trebles and a four-horse accumulator totalling 11 bets. The Canadian is five horses in 26 combinations and the Heinz is six horses in 57 combinations. These bets mean that if some of your horses do not win, you still stand to make a profit based on other results going positively. The betting exchange has made It possible for punters to make profits even from losers. In these bets, you are effectively acting as the bookmaker, choosing horses that you believe will not win. Lay betting requires you to have sufficient funds in your account to cover any losses that may be incurred on your part. Lay betting is an advanced form of betting and requires a familiarity with what you’re betting on so that you’re aware of the risks that are involved. In all horse races, winning odds are returned as starting prices (or SP). It’s worth keeping an eye on the odds of a horse that you are confident in as odds are constantly fluctuating. Sometimes a best odds guarantee will be offered meaning that in the case of an SP being greater than the earlier price, you will be awarded your winnings at the higher odds. This does not apply to ante-post betting where you risk losing your stake if the horse does not run. This applies unless the race is marked as “non-runner – no bet” at the time of placing your wager. When it comes to Irish horse racing – and further afield as well – there are a huge number of variables that need to be taken into consideration when making a betting selection. Below is our detailed guide on the factors that could potentially give you an edge when placing a bet. The racecourses in Ireland and Britain bring with them more variety than any other location in the world. Each one has its own intricacies that trainers – and punters – need to be aware of. The nature of the track can play a big part in deciding a races result, so a knowledge of it prior to betting is important. For example, a race at The Curragh is going to be different than a race at Leopardstown, due to location. It’s important to do some research when betting on horse racing, and thankfully there are several excellent industry sites with detailed course guides available. The going is a is a description of the conditions underfoot on the course and it is important because it can affect a horse’s performance. When making a horse racing betting selection, be sure to take the going into account – some horses show their best form on soft or heavy ground, whereas some are at their pinnacle on fast racing ground. How long a race goes on for will obviously factor into the result. Depending on the event, races can vary considerably in distance, both on the flat and over jumps. The shortest race distance in Ireland is five furlongs, with this distance rising up to two and three-quarter miles. In jump racing, the course distance has a tendency to range from two miles to four and a half miles. Horses tend to have an optimum distance where they perform at their very best. For example, if a horse has been regularly winning over a distance of seven furlongs, there’s no guarantee that it will have the endurance abilities to win a race over eight furlongs. Sometimes, all punters need to see is a trainer associated with a horse to know that it is a relatively safe bet. When the likes of Willie Mullins or Aidan O’Brien are involved, there horses may appeal to punter. Statistics are readily available on the form and records of specific trainers, meaning you can make an educated decision before placing a bet. In addition to trainers, many punters will bet on a horse if they are confident in the jockey. If the likes of Ruby Walsh are involved, it may be enough for a punter to rely on. In the same vein as trainers, statistics are available in abundance on jockeys and how they have been performing in previous races and historically. When betting on horse racing, one of the most important things to have an understanding of is the different types of races. There are two very distinctive codes of racing – Flat racing and National Hunt Racing – with both providing high quality racing throughout the year. Maiden races are the first races that a racehorse enters at the age of two. The surface is flat, and while these races can be difficult to judge due to the horse’s lack of experience in a racing setting, they can be a great place to see future winners. By keeping an eye on maiden races, you can formulate your own list of horses you like, before even the rest of the racing world becomes familiar with them, which could prove profitable in future. Handicaps are races in which horses are weighted to have an equal chance of winning the race. AN official rating is assigned to a horse based on their form in previous races. For example, a horse rated 100 is rated 10lbs superior to a horse rated 90 – at one mile, 2lbs equates to one length so the horse is rated at 5 lengths superior. Handicap races can be notoriously difficult to predict, but they still have huge popularity among punters as they can offer better odds for selections. The purpose of group races is to establish the “best horse”, usually at level weights or weight-for-age. The highest class of flat racing is Group 1 down to Group 2 and Group 3. These races do tend to have shorter odds, but that’s not to say there isn’t value to be found in group races as well. Bumpers is the name given to National Hunt Flat races, and these races are restricted to horses that have never raced on the flat. Bumpers were originally introduced to provide experience for late maturing National hunt bred horses. The races have become so popular that they now occupy championship races in this division at Cheltenham and Aintree. Within these races, betting opportunities are limited as there is generally very little information to go off of. That being said, these races can help you formulate an opinion of new horses for future races so they are well worth keeping an eye on. Think of novice races as the equivalent of maiden races when it comes to flat ground. In novice races, horses can race over novice hurdles from the age of three. Many trainers make the choice to switch from flat ground to hurdles in the Winter months. While the name novice suggests a beginner, a horse can win more than one novice race – however, a win in more than one novice race carries a penalty for doing so. As horses are jumping fences for the first time (generally) they can prove a risky bet for punters. Having some knowledge of the horses jumping ability does give a better inclination as to how to go about betting in a novice race, but this may not always be readily available. Racecourses also play a big part in novice races as the fences are higher on certain courses such as Cheltenham or Aintree. The handicap system works in a similar vein to flat racing only with a different weight to distance ratio. When it comes to jump racing, many of the top races are handicaps – including perhaps the biggest of them all, the Grand National. With these races, oftentimes the horses have been in training for a long time, meaning that if you keep up with your racing, you may have an understanding of the horse’s abilities and how it will be able to perform in its surroundings i.e. what the best race distance and preferences of ground is. Top-level weight events within the National hunt are called Grade 1 races. These races include the Champion Hurdle and the Cheltenham gold Cup, so they represent the pinnacle of races for the best chasers and hurdlers in training. Grade 1 races are spread out across different racing events throughout the year and have varying distances, with the championship races taking place at Punchestown, Cheltenham and Liverpool. Some of the biggest races in the world of horse racing happen in Ireland, and when these events come around, they’re not to be missed! When the weather is good and you’ve come prepared, there’s not a better day out in Ireland than attending a horse racing festival. The Punchestown Festival in late-April is the undoubted jewel in the crown of Irish National hunt racing, with the festival taking place in the iconic venue over five days. The Galway Summer Festival takes place in the picturesque west of Ireland Galway venue in late-July/early-August and boasts a full week of entertainment and some top-notch racing. There’s plenty more such as the Leopardstown and Limerick Christmas race days that occur each year on St. Stephen’s Day (Boxing Day); the Fairyhouse Grand National and the Cork Easter events on Easter weekend; and many, many more. Horse racing has a long and illustrious history but all of todays thoroughbred racehorses can be traced back to one of three stallions – the Byerly Turk, the Godolphin Arabian and the Darley Arabian. They were brought to England and bred with English and European bloodlines that helped create the first generation of thoroughbreds. Racing in Ireland and the UK has a rich history and has served as the foundation and inspiration for many of the top races across the globe. The rules of racing were put into place in the 17th century in the year 1666 with the first run of the Newmarket Town Plate. It wasn’t long until racing became a popular sport among the Royals and aristocracy, from which the nickname “The Sport of Kings” was derived. 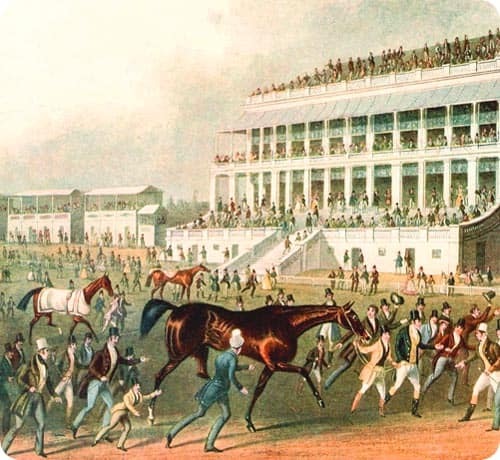 In a testament to the longevity of the sport, many events that began hundreds of years ago are still running today, with the ST Leger, first run in 1776 being the oldest of the five classic races. The Derby in the UK has since lent its name to some of the biggest races across the planet, including the Kentucky Derby. The Cheltenham Gold was surprisingly originally a flat race run upon its inception in the year 1819 but transitioned to a steeplechase in 1924. The showpiece event of the racing calendar, the Grand National, first took place in 1839 and now carries prize money of £1 Million. Our guide to Irish and UK horse racing has hopefully given you an insight into the very popular sport of horse racing and the betting that goes with it. The horse racing calendar is in motion throughout the calendar year, so there’s almost always something to have a flutter on. If you are serious about betting on horse racing you should monitor and keep track of your bets , wins and losses. This will assist you with betting responsibly – betting on horses is for entertainment after all – but also to see what is working for you and what isn’t. With so much racing going on of a daily basis across Ireland and the UK it is near impossible to monitor the form of every horse, but what you can do is find the types of races that you have the most success on. In doing this, you will also be able to mark off racing types that you haven’t been so lucky with. Above all, horse racing is to be enjoyed, so only bet what you’re comfortable with and enjoy yourself!